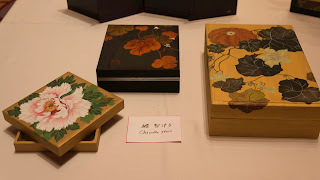 According to Wikipedia: Kakizome (literally "first writing") is a Japanese term for the first calligraphy written at the beginning of a year, traditionally on January 2. Every year my Japanese painting Senseis (teachers) host an incredible party for all their students. It is a Kakizome Party held in January at the Tokyo American Club in Tokyo. 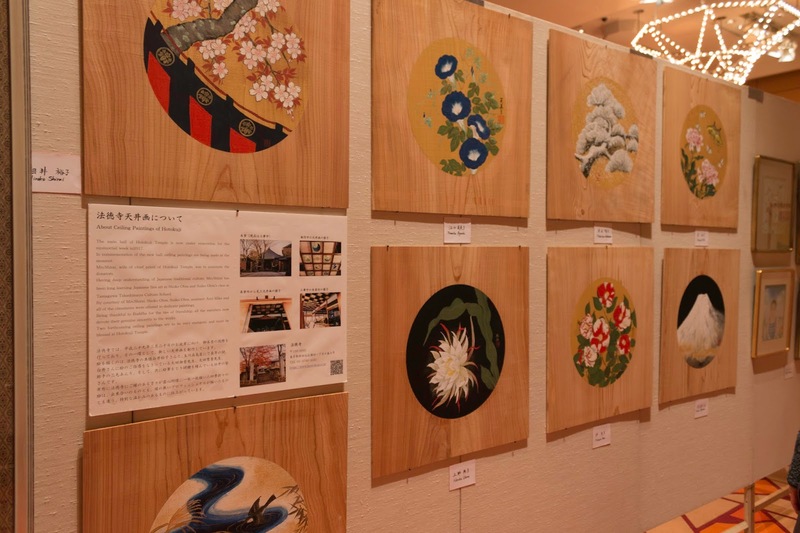 You can see the works of both beginning and advanced students on display with beautiful articulations of the "Japanese Brush". The Kakizome Party held at the Tokyo American Club is sponsored by the Ohta Senseis every Year. Whenever I look back at my Japanese classes. I have come to realize - that slowly, my Senseis have changed the way they teach me. Over the last 3 years, they have slowly allowed me to depict compositions from my photographs - which are mostly landscapes from my various adventures in Japan and Asia. The Kakizome party is unique because my Senseis teach many students who are expatriates in Tokyo and/or from outside Japan. 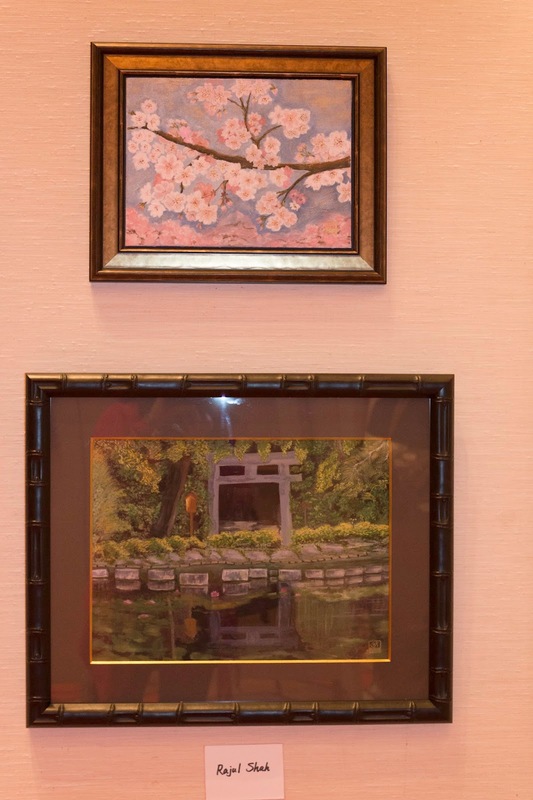 Thus; the subject matter we choose to paint may be Japanese in tradition - but with an "untraditional" Japanese composition. For example. there is one artist who does not like the color Gold - which is a very traditional color used throughout Japanese paintings. Instead, she highlighted many pieces in various shades of Blue, Grey/Silver and Black. in non-traditional colors of grey and blue. 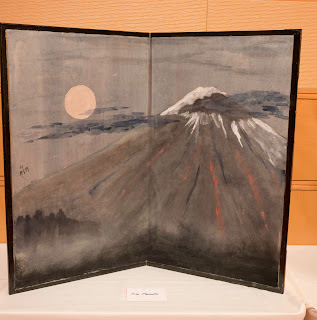 Last year I blogged about this party and the Art of Japanese Brush The Art of the Japanese Brush... and talked about the various tools of Nihonga and Sumi-E Painting. Allow me to speak of why I find this painting medium to be so beautiful. A lot of it - for me - has to do with the pigment used when painting in color. 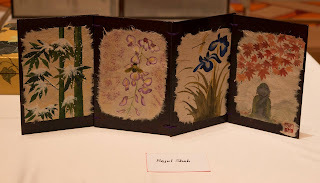 Traditionally, Nihonga involves painting on Washi (Japanese paper) or silk. The paintings can either be in monochromatic or polychromatic. 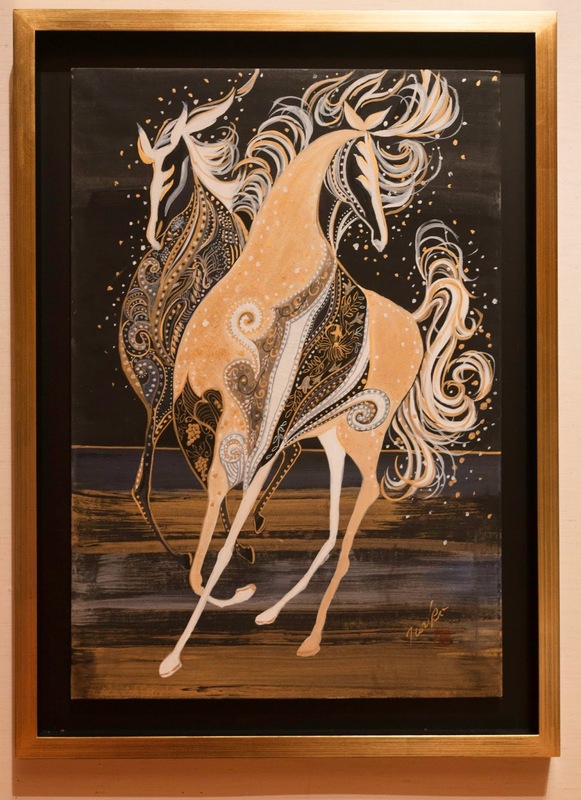 Customarily monochromatic paintings are in black/grey/white and these are called sumi-e paintings. 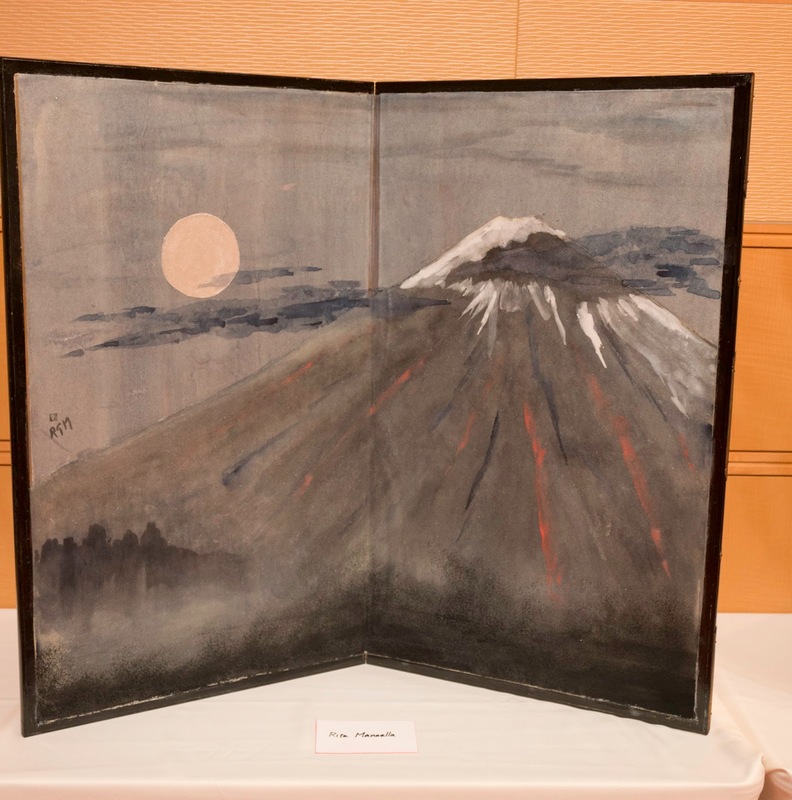 Sumi is referred to as a Chinese ink made with soot. Originally, this brush painting technique emigrated from China into Korea and Japan. Polychromatic Nihonga involves various pigments which are traditionally made from natural ingredients, such as shells, corals, minerals, and semi-precious stones like malachite, azurite and cinnabar. They are grinded or blended into powders with some sort of hide glue solution to be used as a binder. 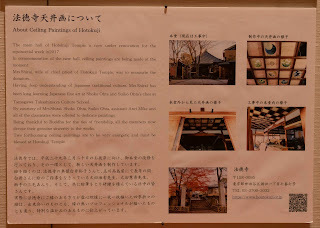 Water is also used and hence; Nihonga is a water-based medium like traditional Watercolor. 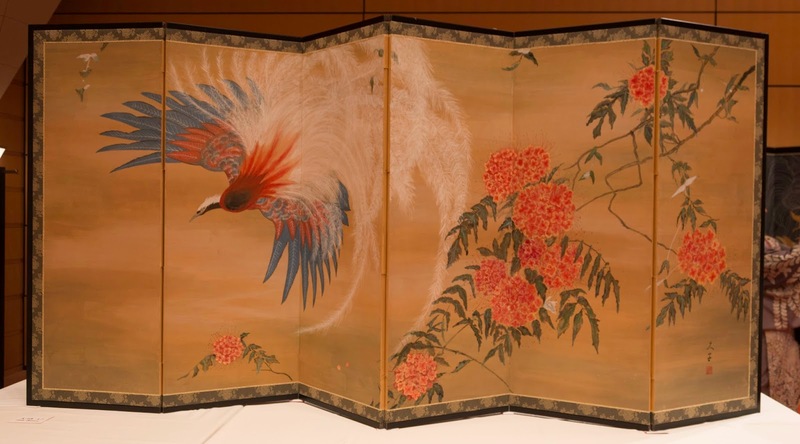 Still; Nihonga paintings offers vivid palettes and when mixed together - colors can be bright or muted, opaque or transparent. I asked my Sensei regarding the source of various colors. While now, synthetic materials may also be added to meet the demand for paints... here is a listing of the natural ingredient that is still used as a base. 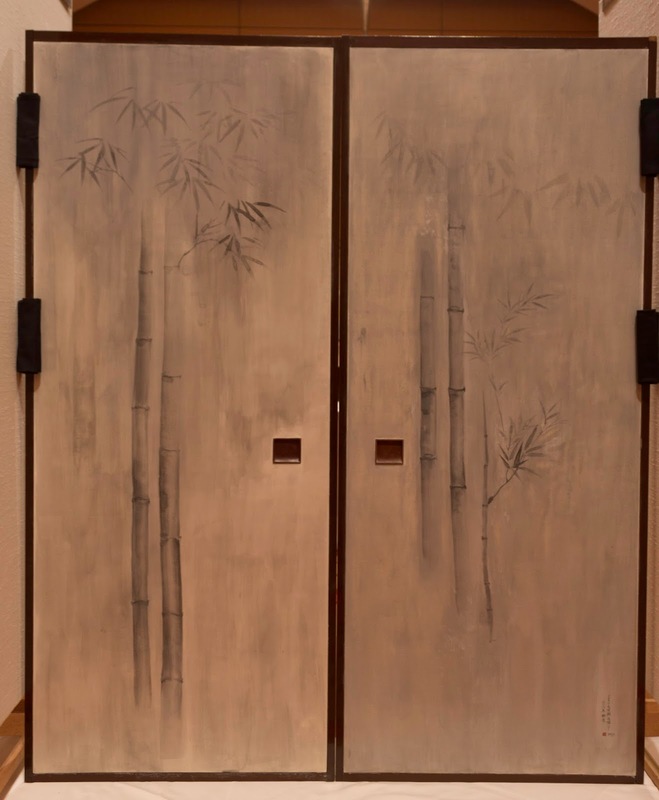 Initially, practical applications for nihonga were for sliding doors (fusuma) or folding screens (byobu) - highlighting the cultural aspect of Japanese culture for surroundings to be especially aesthetically pleasing. Paintings are also done on hanging scrolls and hand scrolls. 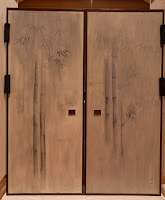 As part of the Kakizome Party, there was an artist who painted on both sides of doors that would be used in someone's home. 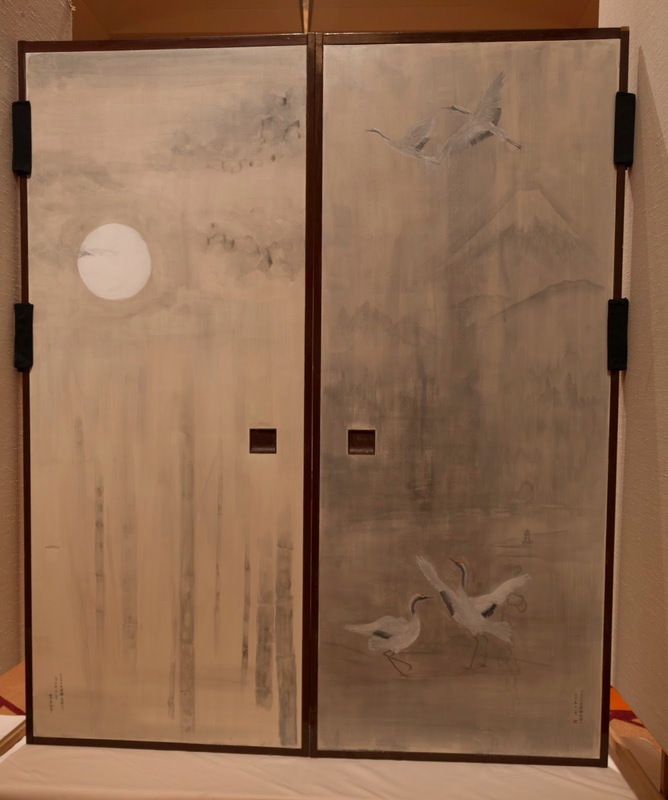 Other side of Door depicts a forest scene with the moon. As an artist, I love to experiment. I have experimented using Nihonga on untraditional substrates (surfaces), including Watercolor paper and Acrylic grounds, such as fiber paste. 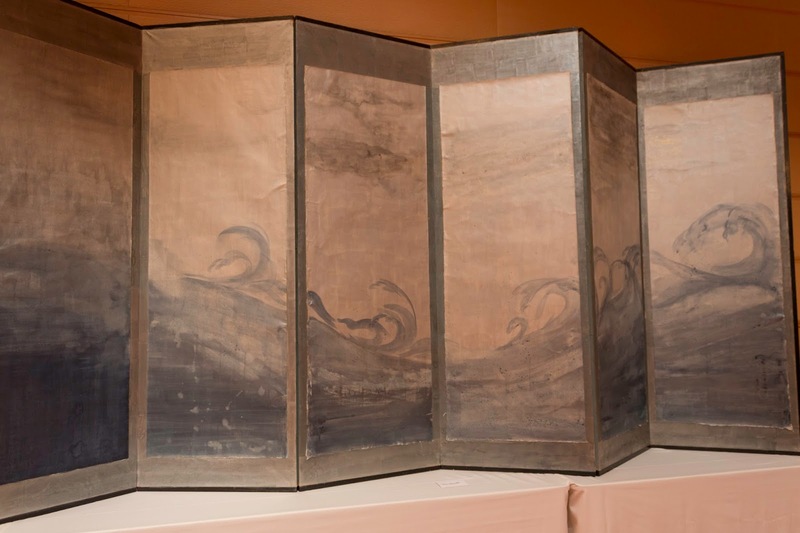 Any substrate or surface that can take on a water-based medium should - in theory - be able to take on Nihonga painting. And so, here are my "experiments" as shown in the Kakizome party. 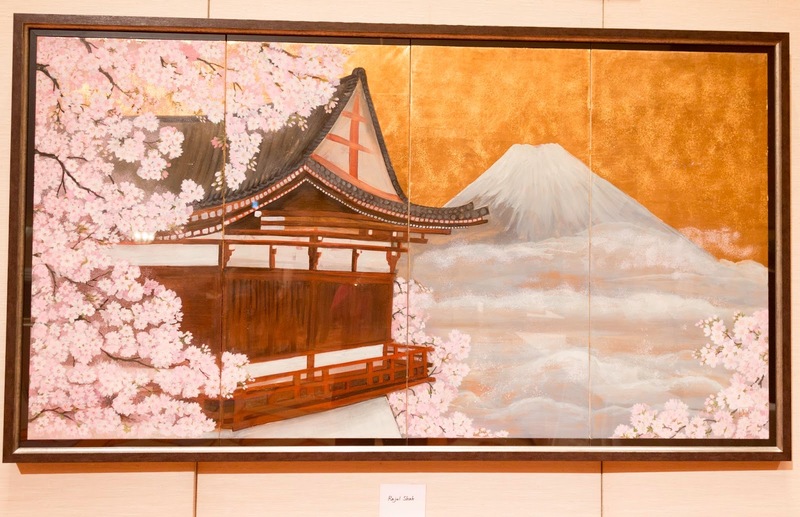 The Cherry Blossoms are done on a panel where a foundation of Acrylic fiber paste was laid down to provide a textural background. The bottom painting is on 300gsm watercolor paper. 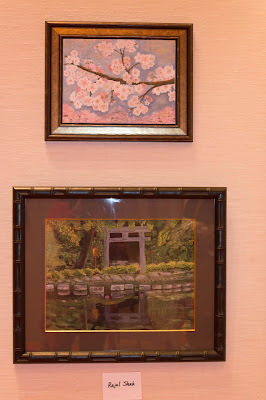 Both paintings are inspired by photographs I have taken during Cherry Blossom season and my travels in Kyoto, Japan. My other contributions to the Kakizome Party used more traditional surfaces. 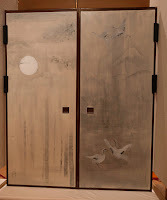 of the Japanese tea ceremony (I found these panels at a local flea market). 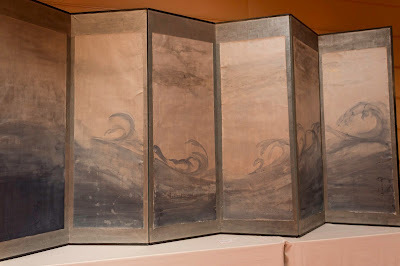 All 4 panels measure 57cm high and 20cm high. I loved the detail on this piece - the spirit of the horses suggest grace and power. This blue and fiery orange colors of the Pheonix stand out against the backdrop of Gold. One of the classes was charged with painting new ceiling tiles for a local temple being restored. A beautiful temple will have the paintings from these students in its ceiling for posterity.